The quest for a mature and restful faith. The Offertory is another one of those hidden treasures at Mass. It is easy to miss because a lot is going on at this point in the Mass. The Altar is being prepared, the offertory basket is being passed around, and the gifts are being brought forward. I want to focus on the latter of these events. In the early Church when the congregation would bring up the gifts, it was not the same as it is today. “ They brought not only gifts of bread and wine, but also gifts besides for the Church, and the clergy and the poor. There were many things described: food stuffs, candles, oils and the like. The descriptions of these offertories vary a good bit but some were very elaborate. Gifts were brought forward and sorted out on the spot by deacons and others.” People would give of themselves for the Church, offering food, chickens, and whatever they sought fit to gift to the Church. This is a beautiful way in which we as lay persons participate in the sacrifice of the Mass. 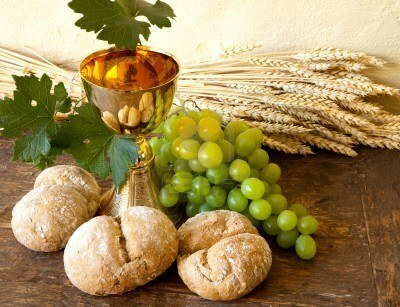 In the early Church we brought forth the work from our hands, the fruits of our labor, grapes and bread for the Church to make the bread and wine for Mass. For me this was a mind-blowing discovery. How wonderful it is that we are asked to offer gifts that will in turn unite us fully to Christ. So how does this relate to us now? I am certainly not going to bring a chicken into my Church and place it on the altar. However, what this does mean for us is that we need to think about what we offer to God during the Mass. “Therefore I urge you, brethren, by the mercies of God, to present your bodies a living and holy sacrifice, [a]acceptable to God, which is your spiritual service of worship. And do not be conformed to this world, but be transformed by the renewing of your mind, so that you may prove what the will of God is, that which is good and acceptable and perfect” (Romans 12:1-2). Here the Priest is acting as our intercessor and asking that our self-offering to God may be a worthy and living sacrifice. This entry was posted in The Mass and tagged Altar, Church, Early Christianity, Eucharist, Mass, Offertory. Bookmark the permalink. What kind of Church do you know? How Dare Pope Francis Speak About Politics!